Recent findings reveal that average real estate commissions in Australia vary significantly state-by-state, according to LocalAgentFinder.com.au. The research underscores how important it is for potential home sellers to do their research before selecting an agent. Vendors in South Australia enjoy the lowest commissions in the country at an average of 1.99% of the total property sale price. In comparison, sellers in NSW and Vic pay an average of 2.03% and 2.05% commission, respectively. This may not seem like a major disparity but certainly has the potential to add up quickly when you consider average property values in each state. Typically, you’ll pay a lower commission in metropolitan areas because there are more properties on the market – commission-based agents are forced to lower their rates to stay competitive. CEO of LocalAgentFinder.com.au, Matt McCann, puts high commissions in Victoria and New South Wales down to the strength of their property markets. “The average commission in NSW and Vic are indicative of the robust market in these states – particularly in the metropolitan parts of these states,” he says. 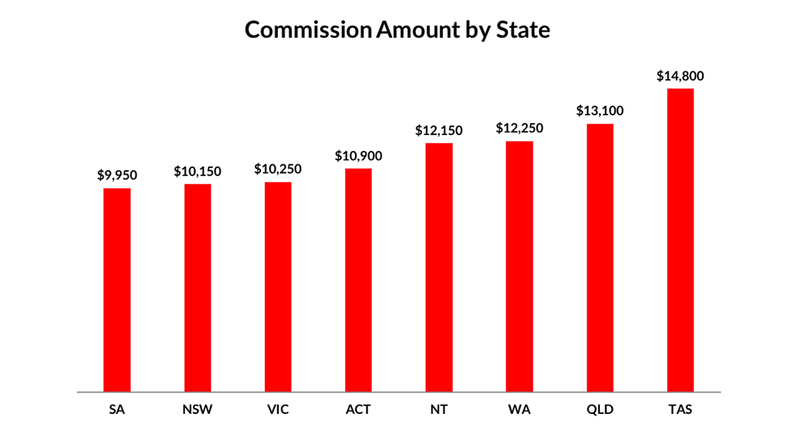 While average commissions in NSW and Vic just over 2%, NT, WA, Qld, and Tas are even harder hit, with commissions in those states ranging from 2.43% to 2.96%. In practice, though, Sydney and Melbourne sellers are facing some of the highest commissions in the country when factoring in median property prices in each city. Agencies like Upside charge a fixed fee of $7,500 for private treaty and $8,500 for auction. To find out more, book a no-obligation property appraisal. Median property prices are taken from the Domain State of the Market Report Decemeber 2017. So, what are the recommendations for people thinking about selling a property? Do your research before choosing an agent. McCann says vendors rate an agent’s ‘ability to get the best outcome’ as the number one factor when choosing an agent when they register at LocalAgentFinder.com.au. With that in mind, many vendors are opting for no-commission agencies with a solid reputation to be assured of a fixed fee from the get-go and good service regardless of the sale price. At Upside, we charge a fixed fee of $7,500 for private treaty and $8,500 for auction to manage everything from photography and marketing to open homes and liaising with buyers. Our real estate agents are also paid bonuses (by us, not you) based on the level of service, not just the sale price. We also offer a free property value estimate, so request your free property value report now to get an idea of the worth of your home based on recent and historic sales data in the area.